Perth Oval is a multi-purpose sports stadium located in state of Western Australia close to Perth’s central business district. 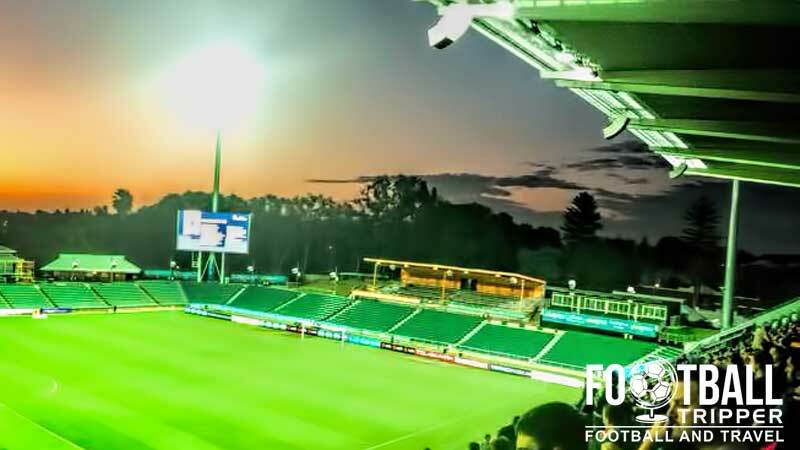 Known as nib Stadium for sponsorship reasons, the ground is currently home to A-league side Perth Glory FC and Rugby Union side Western Force. The land on which Perth Oval stands was originally owned by the Lord Mayor of the city but later sold to the council in 1904, retaining it’s name of Loton’s Paddock for many years before eventually becoming Loton Park. Used for a variety of sports including Australian rules football, both codes of Rugby and Cricket unlike a lot of venues in the country, it also has a strong historic connection with Soccer. Known as Association Football matches at the start of the 20th century drew over 2,000 spectators including the Charity Cup Fixtures which saw a group of Civil Servants take on prime Olympic Athletics. Another notable fixtures occurred in 1927 when the Western Australian State team defeated Bohemians 1905 in humiliating fashion when the Czech Republic (then Czechoslovakia) team lost by a heavy 11-3 margin. When Perth Glory joined the National Soccer League in 1996 there were already concerns that the Oval shaped pitch would prove to be inadequate for both the competing teams and spectators with the ground’s management opting to erect temporary stands, a move which initially quelled concerns but ultimately failed to solve the problem in the long run. With growing pressure from both the resident Soccer and Rugby teams, The Town of Vincent relented and developed the ground into a fully rectangular stadium (Not Melbourne’s Rectangle Stadium). With the stadium no longer hosting sports which required an oval pitch this was the sensible thing to do and now the ground is capable of holding 20,500 soccer fans during A-League Matches. 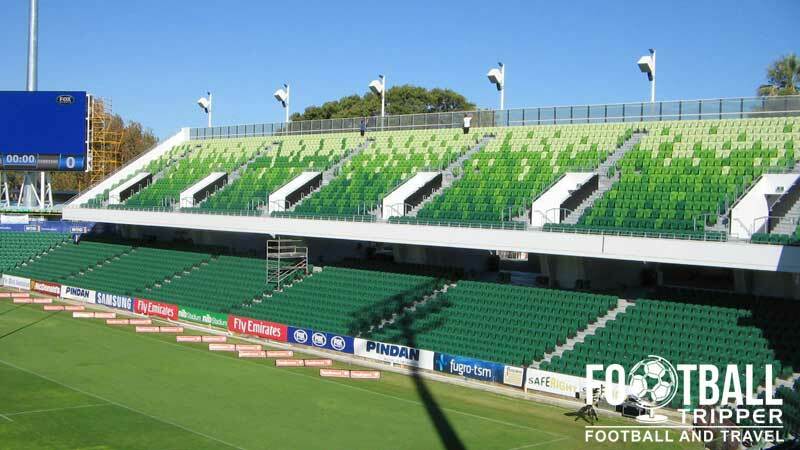 Nib Stadium consists of the following four stands: North, East, South and West. When it comes to drinking and visiting the Nib Stadium you essentially have three choices, or if you combine them altogether, four. They are: Drink in downtown Perth, drink on Beaufort Street north of the ground or drink at the stadium itself. Using the Bell Tower as obvious reference point there are at least 30 pubs within a five block radius or so, with The Moon & Sixpence British Pub and Durty Nell’s Irish pub decent starting points. Situated between those two there is The Generous Squire and the Belgian Beer Cafe, with the Brass Monkey slightly further away. Approximately 10 minutes three blocks north of the former Oval there is a good strip of bars on Beaufort Street including The Beaufort Street Merchant, the Queens Tavern and Clarences Bar. Inside the stadium you of course can also purchase plenty of cold ones. Southwest of the ground on Weld Square there is a McDonald’s Northbridge which gets predictabley popular on matchdays, with the remaining usual suspects such as KFC, Nando’s and Hungry Jack’s (Burger King located just outside Perth’s main railway station back in the centre of town. In addition to the many merchandising kiosks which come into operation on matchdays fans can also purchase a whole load of Glory goods online via the club’s new online store,. 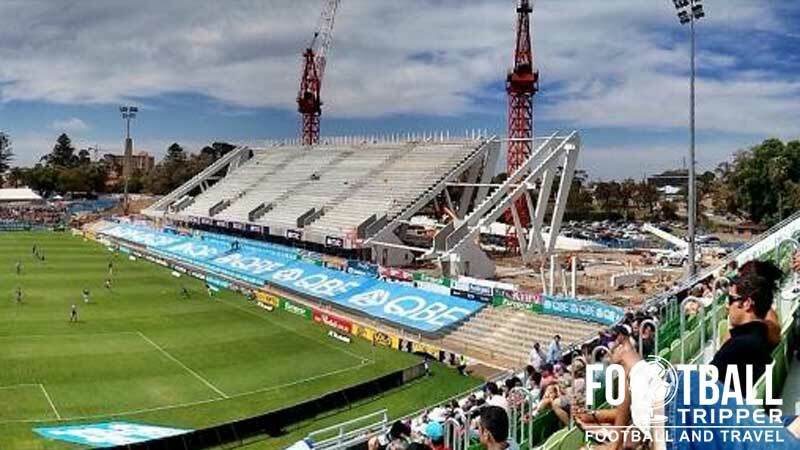 It doesn’t appear as if the operators of nib Stadium currently offer fans the chance to undertake a guided tour of the new facilities at the former Perth Oval site. If this changes in the future however, we’ll be sure to update this section. The distinctive purple colours of Perth Glory. Gotta love the a-league for the bright colours. Please note that the above ticket prices are illustrative for the 2015 season and do not include handling fee ($6.15) and payment processing fee for some credit cards. Nib Stadium is located less than 1.5 miles from what many would consider the centre of Perth’s central business district between the areas of Highgate and Northbridge. The iconic gate to the former Perth Oval cricket stadium has still been preserved to celebrate the ground’s history. 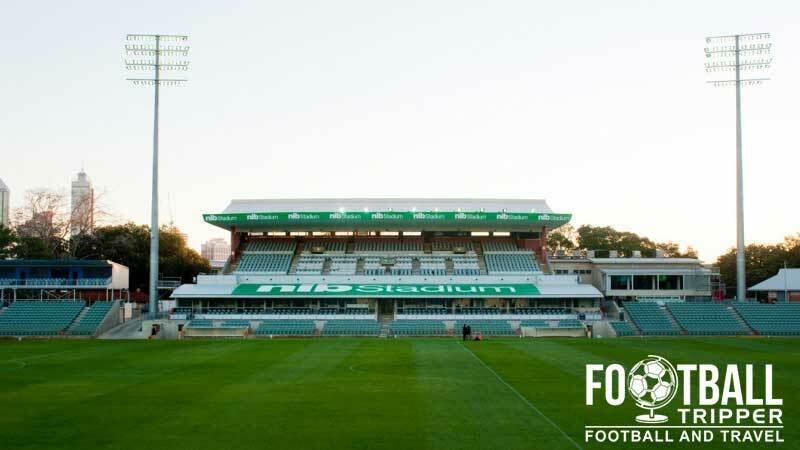 Perth Glory have worked in conjunction with the City of Perth to offer fans travelling to the match a discount of $5.00 on their parking when they use the car parks on either Newcastle Street (47 Newcastle Street & Aberdeen Street, East Perth) or Royal Street (158 Royal Street, East Perth). All you have to do is produce your match ticket to receive the discount. 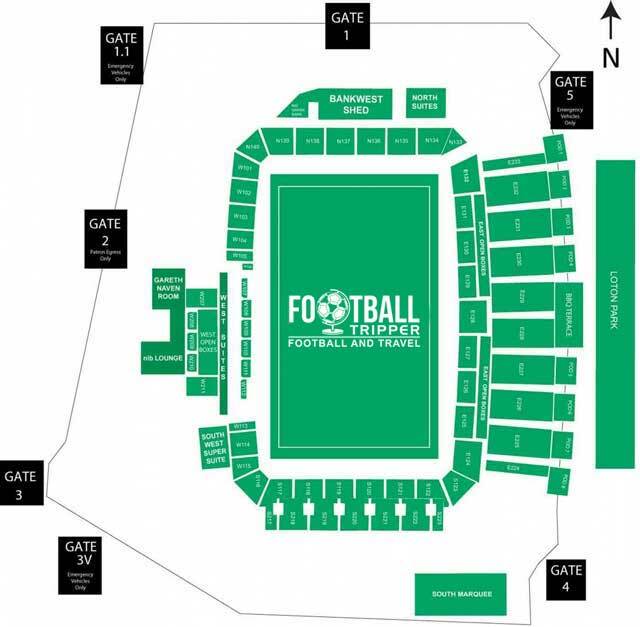 The closest stop to the stadium is Claiseboork Station which is approximately 300m from Gate 4, with the city’s main train station, Perth, located less than 1 mile away from Gate 3. The walk from the city centre shouldn’t take any more than 25-30 minutes. The main platform for Claisebrook Station which is a satellite station from Peth Central. The two main bus services which can take you to the ground are the Eastern 103 which can take you to Lord Street, and Eastern 105 which stops at Beaufort Street. For up to date bus information and timetables please visit the Transperth website. The closest and most recognisable hotel chain next to nib Stadium is the Hotel Ibis located on Robinson Avenue less than two blocks away, with Perth city centre also teething with choices such as Travelodge, Comfort Inn and Hotel Novotel. For those on a budget both there are lots of hostels around such as the Emperor’s Crown and The Old Swan Barracks Backpackers.